[New for 2015, back briefly for January 2016] Alright, time for a quick review of Burger King's brand new Red Velvet Oreo Shake. 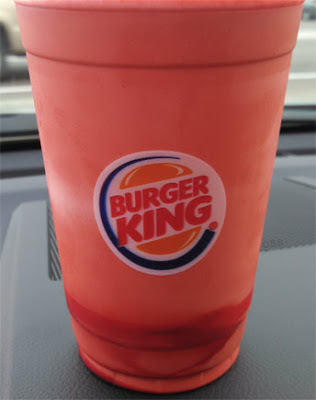 That's right, the BK Oreo Shake now has a brother that's filled with so much red dye that you might run for the hills, or at least turn away. Oh, sure it looked innocent enough at first, but then, when it was done, it looked like this. Oh so very very red.... and did they forget my Oreo bits??? For the love of Pete! Uggg, I think they did! Oh well, let's review it anyway because while it may not be a completely fair test, let's be honest, we all want to know what the red velvet syrup really adds besides a ton o' food coloring. Here goes: It tastes like red velvet. like. a lot. Kind of in your face, not sure it's real, why did I buy this again type red velvet. Maybe the Oreo bits would have helped balance things, but the problem is, it's strong. It's not deathly strong, but it loses it's mystique quickly. It's red velvet, not red velvet cake or red velvet cheese frosting, it's red velvet. Well, food science red velvet anyway. The underlying problem is that the regular Oreo shake isn't that good to begin with. The texture isn't very good, it's not very cold, and it just feels far removed from what a real awesome cookies & cream shake should taste like. It wasn't horrible, and I wasn't spitting it out, it just was meh. Now if you adore a strong red velvet taste, and you don't mind BK shakes in general, you'll probably be fine, but if you were thinking about rushing out to try one, I would say don't rush too hard. I didn't even finish mine. Verdict? very very red. tolerable at best. Note: @evilpez4 told us about the new McDonald's Canada Red Velvet Oreo McFlurry. I can only assume that it's got to be way better..... Update, the answer is no, it's not better. While being very red, the mcflurry is surprisingly very boring. Oh well.... wait, one more pic. They should had used the red velvet oreos. The only thing that could make this less appetizing is if they used cochineal dye. MY STOMACH FELT SICK AFTER DRINKING THIS......THEN THE DIARRHEA...THEN THE RED DIARRHEA...FREAKED ME OUT..WON'T DRINK THIS AGAIN!!!! Dubba Scoops, I'm the one whose son bought the shake for me today. Trust me, I'm not embellishing. I'm really sick from it, and the symptoms as well as the shock of the red color of the symptoms are very real. Since other people are having similar experiences, I really wanted to warn people about this milkshake. BK should consider another formula or taking it off the menu all together. Thank you for the clarification, I hope you feel better! Had red velvet shake at 9pm. I have been in the bathroom since 2am whilst my body violenty rejected it. The red struggle is real. I just want to add, this is absolutely true. I happen to know that I have a sensitivity to red dye #40, so I should have known better. I couldn't believe how red the shake was when they handed it to me. Like vampire red. The next day I had a terrible stomach ache. They must put the equivalent of an entire bottle of red dye in this stuff. This shake should be taken off the market. And for clarification, I actually enjoy the regular Oreo shake at Burger King and have purchased it many times, but the "red velvet" did not taste any different to me than the regular Oreo shake. Cream cheese? Not that I could taste. I agree. I freaked out and actually made my husband come look. Gross I know. But I thought maybe I needed to go to the hospital. I've been in the bathroom 5 times in 2 hours. I FINALLY put two and two together and looked up the shake. Thank you for posting. Its not a fabrication! I also had bad cramps and diarrhea from this shake. It was blood red and scared me until I thought, well I did just consume a medium cup of red dye. Some peoples tummy just can't handle that much dye. Hi! Wasnt trying to demean anyone's suffering, I just felt that I should add a disclaimer just to be safe. If it makes you feel better (redder? ), I made the mistake of eating a red velvet bagel. Won't do that again!